Great colors and pattern in your dress. This is really a great look! Thanks so much Jodi! I just followed you on Google+. Love meeting fellow bloggers :-) Do you also have bloglovin'? Would like to follow you there as well. Happy Friday! Oh that's a great idea!! I'll check you out and start following! Gorgeous look! I'm a gal that loves her print, especially in a simple shift cut, styled to perfection! 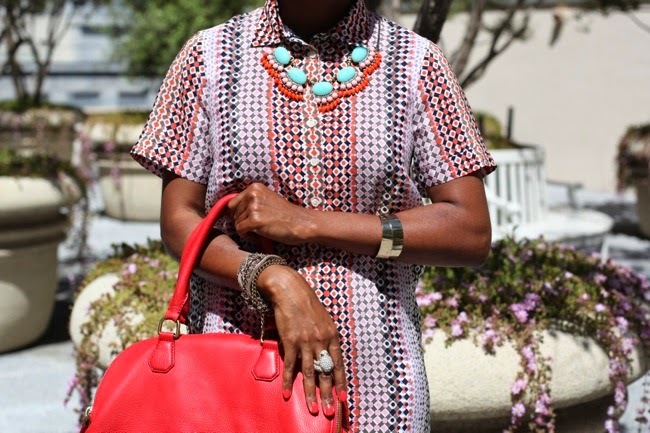 That turquoise necklace is DEF what amps this look up- perfect mix! I love your look Riana, what I like most about your outfit is that red bag! Accessories make or break and outfit. Hi Vita, thanks a bunch!! This is my fav red bag too :-) And you're right, accessories totally make or break the outfit! Just love this outfit, and all the colors. What a great ensemble! Thanks so much! :-) Hope you're enjoying your weekend! Love the colors on the necklace and dress. Yes! But here I feel like the dress is the statement piece and the necklace is an addition. Your dress is lovely! The necklace compliments it well. Umm GORGEOUS dress. Love the print and everything about how you styled it! Heading to J. Crew ASAP!